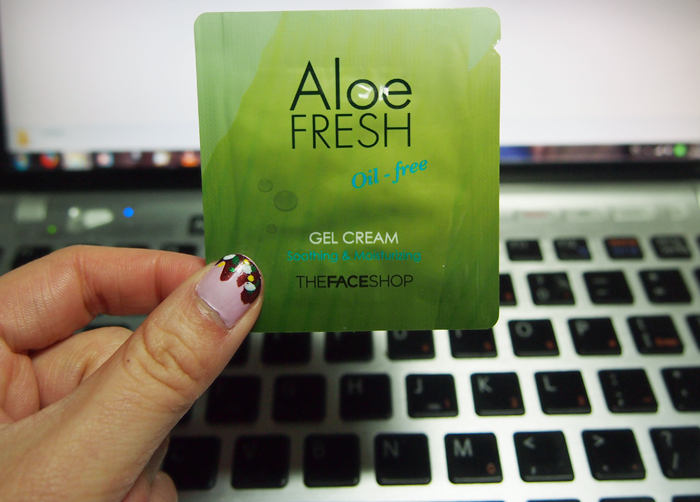 The first sample (and one of my favourites) I'll be reviewing is The Face Shop's Aloe Fresh Oil-Free Gel Cream. Unfortunately, I couldn't find a description of the product on the official The Face Shop website so you'll just have to run with my opinion and the teeny amount that was written on the packet. I guess it's for the Aloe Fresh line? Maybe suitable for sensitive skin (I dunno, just taking a stab in the dark guys...)? What they say: "Soothing and moisturising." Performance: I loved using this gel cream! It made my face feel so nice and smooth. I used around 12 packets of the stuff. I love the soft, waxy smell and the gel texture of the cream. It provided adequate moisture to my thirsty, dry skin without irritation. Although the gel cream was sufficient for most of my face, my nose area required thicker moisturiser as it is especially dry. My CC/ BB cream will pick up the flakes on my nose if I only apply this gel cream. This however, isn't a problem if I do not apply makeup on my face. - provides adequate moisture and it's oil free! I liked this product a lot but the ingredients list makes me think about using it on a long term basis. Alcohol in the ingredients list doesn't worry me, but the myriad of parabens and dimethicone does. This just means I would probably switch up this product after using it for awhile, and I wouldn't slather it sparingly on my face. I would buy the full version. I haven't spotted the Aloe Fresh line at the branch at Galleries, but I have seen it at Hurstville and the new World Square branch. I saw it was in a squeezy tube and retails for around $14.90. TL;DR: Worth a purchase if you don't mind what the gel cream consists of. Smells good, feels good, non-irritating, and moisturising. Winner.